This volume is an exploration of the ethical issues raised by health insurance, which is particularly timely in the light of recent advances in medical research and political economy. Focusing on a wide range of areas, such as AIDS, genetic engineering, screening and underwriting, new disability legislation and the ethics of private and public health insurance, this comprehensive and sometimes controversial book provides an essential survey of the key issues in health insurance. 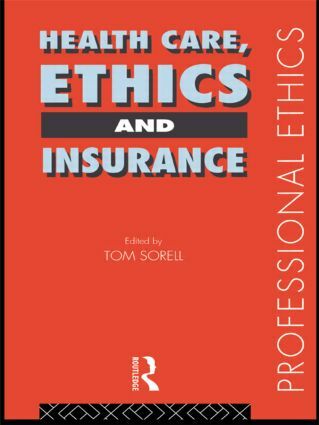 Divided into two parts, the first considers the ethics of underwriting, risk assessment and the acceptance and refusal of insurance risk by insurers. Discussing the unjust treatment of high-risk applicants, the authors identify sources of unfairness to both parties of the insurance contract, indicating how reasonable trade-offs can be made. The second part considers the argument for a mix of public and private insurance for acute and long-term care, offering recommendations for changes in the balance of social insurance, and discussing the shift toward long-term contracts in private health care and pension insurance.